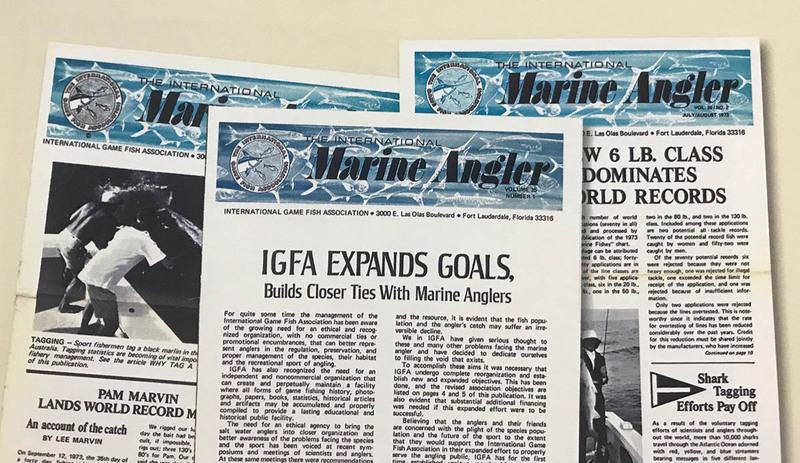 A bimonthly newsletter entitled International Marine Angler was begun in 1973, a publication introduced as a way of communicating with and relaying information to anglers around the globe. The first IMA was a modest eight-page effort curiously marked Volume 35, Number 1. The flyer trumpeted the IGFA’s change to a membership-based association, outlined the IGFA’s goals and policies, and made a number of significant announcements. The introduction of a new 6-lb line class was heralded, and an eight-paragraph history outlined the IGFA’s origins. Part outreach to the angling public and part newsletter to existing club and scientific members, the two-color mailer was a credible first effort in expanding the organization’s reach. From its inception, the International Marine Angler was a fountain of information. By issue Number 2 (July/August 1973), the publication was up to 12 pages and the new 6-lb record category was headline news. More than one-half of all record applications received during the year were for the new line class, with some 40% of the overall total submitted by women. Readers also learned of the capture in 1970 of an enormous 1,805-pound blue marlin taken off Hawaii, the passing of noted outdoor author Joe Brooks, and a history of the black marlin fishery unfolding in Cairns, Australia. This last article was written by Daphne Nielsen, one of the IGFA’s first women Representatives, and detailed American George Bransford’s pioneering efforts off Cairns aboard the legendary game boat Sea Baby 1.